Yep. There they are. My blinding white legs officially saw the light of day. Don’t say I didn’t warn you. Scary stuff for all those surrounding me but it was bound to happen sooner or later. With the weather finally getting warmer in Iowa, it is time to pull out the skirts and sandals to weather the rising temps and pull out the grills for daily barbeques. What goes better with burgers and brats than a little ketchup and mustard? Yes, this outfit (as well as this one) is sadly inspired by my favorite condiments. Wait, you don’t coordinate your outfits to your food? No one? Just me, I guess. Ketchup is taken very seriously in our household. Shades of yellow are gracing the shelves everywhere this spring/summer season, but I wanted to show you how to transition your wintry yellow (mustard) from freezing to sizzling. Simply combine it with a bright printed mini and platform sandals and just maybe a fun pop of color on the nails and lips for a breezy perfect for any summer occasion outfit. What’s your favorite shade of yellow and what color do you pair it with? 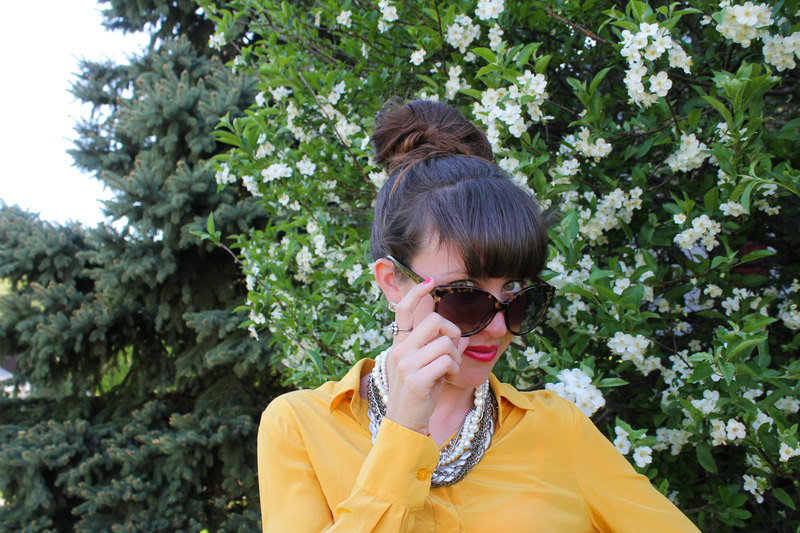 I’m linking up with Marionberry Style today to showcase the yellow trend. Stop by her site (here) to see how other fabulous bloggers styled their yellow pieces.